For those of us staying at the Windsor on Thursday night. We can meet, get something to eat, and then discuss the days ahead. A great way to already have friends to partner with on Friday. Luna (class of 2012), Ms. Dunda, and Ms. Echols are planning a run for Friday afternoon. They will be doing a 10 mile run at 10-11 minute mile pace. Meet in the Cafe. Dress for the weather and the pace. Join us at 3:30 pm Friday afternoon for the 1st (I think) annual Educon Rocky Run. We will meet at the Crowne Plaza Hotel 1800 Market Street, run up the Ben Franklin Parkway towards the Art Museum and then up the famous Art Museum steps. Please join us for an opportunity to exert some physical energy before the kickoff off the Educon conversations. All runners, non-runners, and tourists are welcome. Stay tuned to the #educon hashtag for any updates, photos and video of the run. Come start the conversations early! Meet in the food court beneath Comcast Center, Philadelphia's tallest building, only 5 blocks from SLA. http://www.themarketatcomcastcenter.com/. Contact @geraldaungst on Twitter that morning for the exact locale. Join the Social Studies teachers for a lunch chat about new ideas, upcoming opportunities and camaraderie! Will post a lunch option for ordering closer to the date! eSchool Network (eschool-network.com) just launched on Jan. 1. 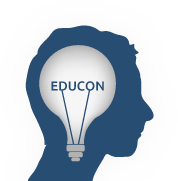 We're looking for Educon attendees to visit the site and give us feedback on the idea! Bring your lunch—and a business card—to Room 209 and share your ideas with us. As far as I'm concerned, it's not a trip to Philadelphia without getting lunch at Reading Terminal Market. Join me on a 10 block walk to 12th and Arch, home of one of the country's greatest food courts. All the businesses inside are local, where you can find authentic Philly options like cheesesteaks, roast pork sandwiches, and hoagies, thick cut pastrami sandwiches, sushi, Pennsylvania Dutch baked goods, and more! Do not miss this totally Philly experience! Do you teach science? Do you love awesomeness? Let's get together in rm 204 after session 3 (4:30ish) and talk about teaching students science. Sunday Morning Breakfast Meetup - Philly Diner Style! I've eaten here almost every Educon. The food is good (classic diner fare), the service is fast and the prices are great. I'll probably be there around 7-7:30 and happy to join anyone else who can make it! Hi I’m Ihor and I’m doing one of the final sessions of the conference “Math 2.0 and the Wannado Curriculum.” and I’d love to connect/touch base with other folks interested in Math Ed before my session. Let me know!